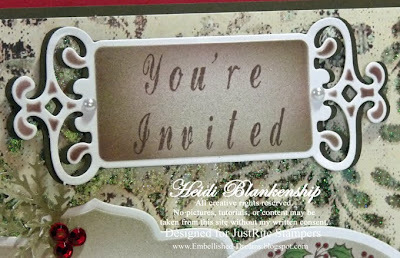 Embellished Dreams: JustRite Mega Font Blog Hop - Personalize It!! JustRite Mega Font Blog Hop - Personalize It!! Are you ready for an Amazing Blog Hop? JustRite Stampers and 54 very talented Ladies are going to be sharing soooooo much creative inspiration with you over the next two days!! Yep, that's right it's a two day JustRite Mega Font Blog Hop!!! JustRite Stampers is also going to be having a wonderful SALE on ALL of the Fonts. Here is the information on the JustRite Sale. JustRite is celebrating their Mega Font Hop (a 2 Day Event with 54 designers) in style with a Super7 Day Font Sale. 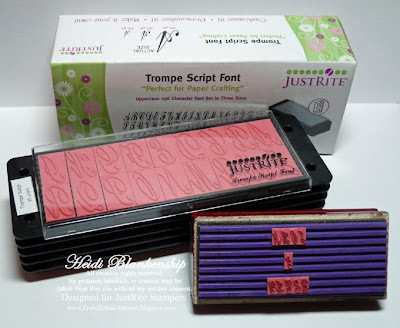 Take 30% off all JustRite font sets and the Horizontal and Vertical Font Stampers. Sale begins Sept 17th and ends Sept 24th. Now if that's not enough for you, JustRite Stampers is also going to be giving away some Blog Candy!! But you will need to read all of the details to find out how you can win--there is a little twist thrown in there. Well, there will be 3 blog candy give-a-ways on each day and you can only win by leaving a comment on the right blog! The real surprise is you won't know which blog has the candy.....even the designer doesn't know! So as you visit each of the 54 designers over the two day event take time to leave a comment.....who knows, the lucky winner may be you!!!!! You have until Sunday at noon to leave a comment for your chance to win. Then check back at the JR Blog on Sunday evening to find out who won!!!! After all of the stamping is done then I lined up the sentiments and images with my Spellbinders die templates. Once all of the die cutting was done then I left the paper in the die templates and used them as a stencil to airbrush with Copic markers. First I used E74 Cocoa Brown and then I added G85 Verdigris. I colored the images using R29 Lipstick Red, YG63 Pea Green and G85 Verdigris Copic markers. I added a few twig punch outs, red rhinestones, pearls and some ribbon. The next card is one that I made for my aunt and uncle's 25th wedding anniversary. For this card I only used the Trompe Script Font Uppercase 25pt along with the 1-3/8'' x 3-1/2'' Rectangular Horizontal Stamper but just by simply adding their names it gives the card such a personal touch. I hope you have enjoyed the cards I shared with you today. Be sure to check out all of the other ladies in today's JustRite Mega Font Blog Hop--I know the inspiration from all of these talented women is going to be Amazing!!! Also be sure to check out the JustRite Blog!! Thank you so very much for stopping by today and I hope you enjoy the JustRite Mega Font Blog Hop!! Don't forget about the Blog Candy--Good Luck!! Wow amazing love waht you made and what a wonderful tutorial so easy to understand, great job. Wonderful projects and thanks for the tutorial too! Oh my gosh! You cards are beautiful. The Christmas Tea warms my heart. What a great idea. Great tutorial, easy to follow, love the "windows" on your card, neat trick. These are just stunning! Wow!!! The amount of detail you put into them is incredible and they have such an elegant and timeless feel! Simply stunning! thanks for the tips on setting the letters. i have been interested in getting some of those handles, since i already have the fonts. Great idea! I love to go to Tea so this has inspired me. wow, Thank you, great ideas and as I am brand new to Justrite the instructions are perfect. Thank you. Thanks for the lesson on centering the letters. I have had such a hard time with that. Your projects are BEAUTIFUL!! Thanks for the tutorial and that was very helpful. Your invitations are beautiful. Thanks for sharing. I love your Spellbinders ideas... and they turned out beautifully! OMGosh...Very elegant and beautiful! Also, Thank you for the tut on centering JR stamps. What lovely projects! OH, I SO adore that teacup image - I wish I could stop everything right now and just go and play with it -- alas, life calls!!! Great ideas! You simplified beauty! Thanks much. I love both cards - they're just beautiful. Great tutorials also with a great tip on how to center the letters. Good info with the dies and lovely work. Beautiful card and thanks for the tips on building the perfectly spaced stamp. I love the combo of stamping and nestibilities, is that removable tape I see in your pictures? The cards are beautiful would could refuse such a beautiful invitation to tea. Great job, Heidi!! Love how you used the airbrush. both cards are just beautiful! Oh my word, Heidi! These are fabulous! Your Christmas card is so touching! Thanks for showing us how you did that too. Your anniversary card is Sooo elegant! WOW! Amazing projects! Thanks for the instructions on centering!!!! Thanks for taking the time to provide the step-by-step process. I've been using the "place and slide and slide and slide..." technique until now which usually means I wind up with a great deal of picking up tiles I've accidentally knocked out. This looks like a much more streamlined process. Oh, and fab projects, too! I just love the invitation. So pretty. I would come if I recieved this. Both of these projects are great. Great tutorial. Beautiful. Thanks for the tutorial on how to center your letters. I never thought of that and it is a great idea. I will definitely be doing that in the future. thanks for the great tutorial! That is so much easier than moving them around!! Your cards are also amazing!! Gorgeous! And what a great idea to put the couple's names on the card front. Very personal. Thanks for the info. on how to get the fonts centered. That was driving me nuts! Wow, what beautiful cards and great ideas! Thanks! Beautiful cards! Thanks for the explanation of centering sentiments. Your ideas are great! 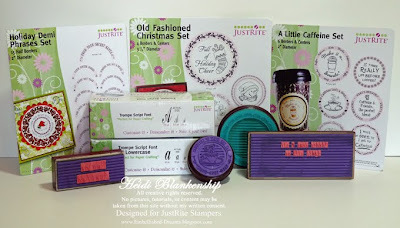 You've given me some inspiration on how to use the Just Rite stampers plus some of the other items I have in my craft arsenal. THANKS! Both your cards are exquisite but the tea one just blows me away. I have no Just Rite products and after seeing all these blog hop entires I must invest in some. Love being able to create your own sentiment. That is t a beautiful invitation, I love it and the anniversary card is spectacular! Love that trompe font! thanks for the inspiration. OK! I want them all, I love your ideas.. .. I love your blog, Thanks so much for sharing. Gorgeous projects, Heidi -- that's exactly the same way I center and place my fonts, too! Thanksf for the great hints and beutiful project ideas. Beautiful cards! Thanks for the tutorial. Heidi, thank you so much for the tutorial on your GORGEOUS projects...did I say GORGEOUS??? WOW, they sure are!! Beautiful. Thanks for the tutorial. Love the Christmas one. I loved your cards! Also, thanks for the tip about centering the letters on the stamp. It can be so tricky, especially with the teeny tiny letters! Beautiful work and helpful instructions. These are beautiful - I had to scroll all the way down just to be sure I hadn't missed anything! Love your designs. Great hint for finding the center point! Awesome projects too! Fantastic information! Wow! Thank you! WOW, wow, wow...Heidi! THese are gorgeous creations! Who wouldn't want to come to that tea party? Those are some beautiful cards. Thank you for sharing those ideas and the tutorial on centering. thanks for the tips and beautiful card. Wow-- what fabulous projects...love your tutorial as well! Thanks for all the great tips, I am new to JustRite, these will come in handy! Beautiful cards. Loved seeing how to line up the text on the dies. WOW!! What inspiration! Thanks for sharing! Simply beautiful, thanks for advise on centering. Wow! Love, love, love these cards! Two beautiful projects. 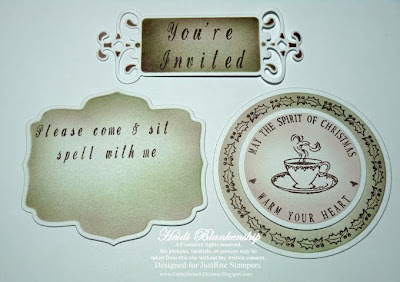 Who wouldn't want to come to tea after such a beautiful invitation? Heidi - these are gorgeous. Thank you so much for the tutorial because I have been wanting to know the same thing. Have a great one !!! love your projects. thanks for sharing all the details. Love it! Anything that has a coffee cup on it has my attention, but using it for a Christmas card is just too kewl! Love your projects! That looks like a great idea to die cut and emboss. Now I just need more spellbinders. Your work is beautiful. 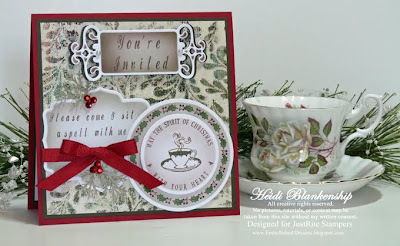 I love the Christmas tea invitation. 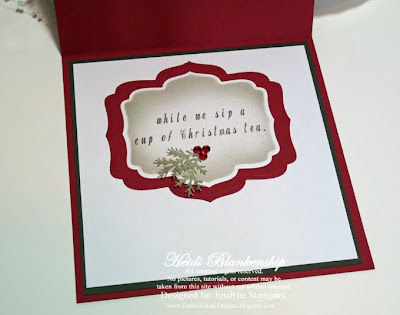 Heidi, your cards are absolutely stunning! Thanks for the centering tutorial! What a gorgeous invitation. Your work is beautiful. Thanks for sharing. Love the hit on lining up the letters. Hate moving them around after they are in! lol Wonderful projects. Thanks for the detailed steps, it really helps me make better use of my stamps! Love your projects! I litterally gasped when I saw your card!! It is absolutely beautiful! 2 gorgeous cards..who wouldn't love to receive either of them..beautiful! Thanks. JustRite ans Spellbinders are twins seperated at birth. They are perfect together. Thanks for taking the time to show how to center the words BEFORE stamping. The card with the cup and saucer is fab! I love your style! you inspire me! Your ideas are just awesome! What a wonderful gift you have! these are great! like the fact that you included pics on how it's done. I was only going to visit long enough to read the Mega Font Blog Hop........but I'm amazed at all the information in your posts. I have to come back! 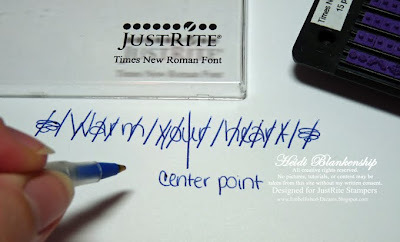 Fantastic tip on centering and use of dies! Beautiful work, too! Thanks! I love your work. It is so fun to see all the ways JustRite fonts can be used and thanks for the hint. These stamps...everybody wants to have them! And the things you've made with them: Amazing! I've always loved the Christmas Tea story. Love how you incorporated it into a beautiful card. This is really special! thanks for sharing your fab work. Ofcourse you enabled me and now I want the horizontal stamper. Beautiful professional looking results! wow! Great tips.Thang you.Greetings from finlamd. wow, I adore your cards, they are just so beautiful, I will have to come back for another look when I get my own JustRite stamps - you know that I am going to have to buy some after seeing all these fabulous cards!! BEAUTIFUL work -- I just might have to lift your idea for the card. Love, love, love it. What can I say ... your projects are just STUNNING!!! WOW!! Wow, where to start! Amazing creations and your visuals are really helpful too. Your work is over the top. Enjoyed looking at all you did for this hop. Thanks for sharing such a great talent. I love JustRite's Blog hops! I can't wait to see all of the participant's blogs.☺ I love your projects. You are so talented! Thank you SO much for the great tutorial on how to line up the letters! I just purchased the 2" circle, and have been a little afraid to try it. This gives me inspiration to give it a whirl...THANKS! Nice invitation! When shall I come? Thanks for sharing your help with us, too. Omygosh what a gorgeous tea card! Thank you for the tutorial, I needed that! I love the victorian feel; especially for Christmas. WOW amazing. Thanks so much for showing us the steps. I always had hard time figuring out how to place the fonts. This is ab fab. 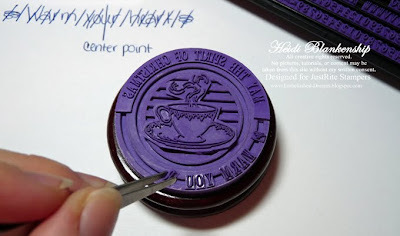 Thanks for sharing how to use the stamper as well as sharing your awesome creations. How elegant! Great tutorial. I'm so inspired. Fabulous projects!! Love your blog too! So many new ones that I can add to my list! Thank you for explaining how you center letters and how to use the various kinds of stampers. lovely projects...and thanks so much for the quick tutorial on how to easily center those little itty bitty letters! Thanks for the tip on placement. Love the projects. 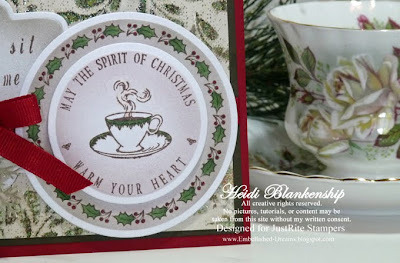 Dottie K.
Beautiful cards, especially the Christmas Tea, something my mother always took time for. Thanks for the great tip. The cards are lovely! WOW! Great cards and thanks for the tips. I can never figure out if I should stamp first or cut first. So beautiful!! I don't know that I could have that much time to put into one card, but it sure looks like a work of art when it's done! Really beautiful. I think the Tea card could be converted into a beautiful Christmas card as well. I love both projects, and I love the colours you have used, so rich. You've knocked my socks off once again Heidi! I love your projects! Your work is beautiful! Thanks for sharing. Your projects are always beautiful and inspiring. Thanks. Please use the email address below my name. Thank you for such a well thought out tutorial! Loved it. Your invitation is beautiful, awesome job. You did a great job on the tutorial. Fun to learn how you make such a great card. Thank you for the tutorial. I like the thought behind the tea card. Wow. I love the invitation and the wedding is also beautiful. Thanks for the tutorial. Beautiful cards and your tutorial is so helpful. Thanks for sharing! Beautiful! Love the images, the dies, the shading... everything. TFS! Love both of your projects and the tips are great! You made some very complex cards. I Love the coffee mug one. Lovin the projects on this hop..tons of inspiration I want to play! Your projects simply take my breath away; gorgeous!!! Love the Christmas card! Thank you for sharing tips on centering and laying the card out. Sure makes trying this on our own easy. You continue to be one of my favorite designers. Everything shows so much attention to detail. I love all of these. 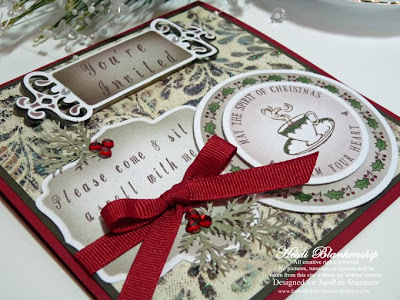 What lovely projects- I want to be invited to your Christmas tea! Thanks for taking the time to make such detailed explanations! Absolutely stunning Heidi, love your designs! Projects are awesome, thanks for the wonderful instructions! 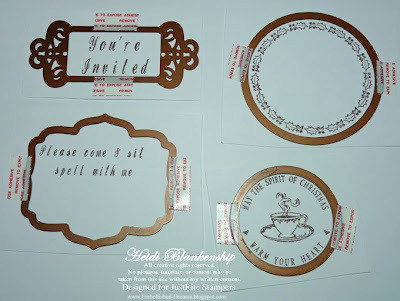 Very creative use of Just Rite stamps and Spellbinders! Wow!!! Gorgeous as usual. Your work is beautiful and very creative. I love what you do. The tea card was my favorite. Thanks for sharing your wondeful talent. Your cards are beautiful. The Trompe Script font makes such an elegant looking card. Amazing details to your projects!!! Beautiful work! All BEAUTIFUL projects. Thanks for the tutorial. Love your projects. Makes me want to add a lot of stamps to my collection! Gorgeous cards and fab tutorial! thanks so much! Thank you for all the tips! This is great! Wow your Christmas is card is gorgeous. I love how personalized it is and that you can say anything with the JR stampers and blocks. Thanks for the tips. 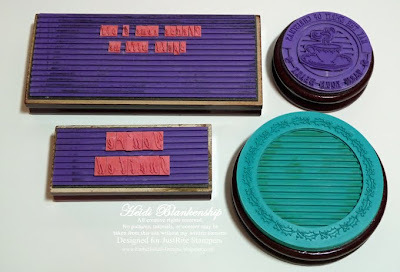 I'm not much of a stamper, but I do love alphabet stamps! They are such a better investment then other ways of doing type on your scrapbook pages! Wonderful tutorial - thanks for sharing your great projects! I really appreciate your tips - thanks so much! 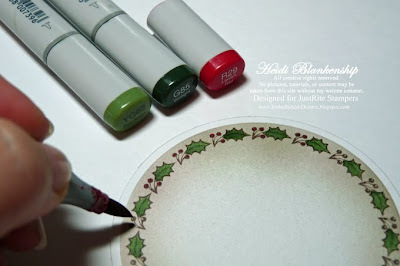 Beautiful and great tip for centering the stamps! I've been in denial that Christmas is on it's way - but after seeing your goodies I think I'm NEARLY (!) ready to start getting organised!! Beautiful. Thank you for the tutorial. Love your copic work. I have always wanted to have a Christmas Tea. Love this idea for the invitation. Thanks too for the centering tip. Thanks for the lesson. What a beautiful card. Thanks so much for the great tips to align the letters. Just got my first SETS and this will come in handy. And I LOVE the Christmas invitation - it's BEAUTIFUL. What a beautiful Christmas card! 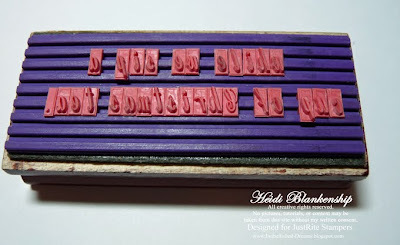 I love sentiment stamps and JustRite is perfect for making your own. Thanks for sharing! I love this. And its so pretty. It makes me want to have a tea party. Thanks for showing how easy it is to use the font sets. coworker. I am sure that your friends are going to have a great Christmas Tea with you. Wow! Beautiful cards. Thanks for the tutorial! I appreciate you showing which stamps you used. Helps me wrap my brain around the Idea. Wonderful projects & great tutorial. TFS! Upcoming Class at Scrapping on the Go!